My daughter was home from university last weekend and noticed a small container of ricotta cheese in the fridge. Lately, I have been spreading it on toast, then showering it with lemon zest and capers, adding few slices of smoked salmon, and finishing with tons of fresh chopped dill for a fabulous and easy lunch. My little doll likes to decompress from all her studies, and endless sorority duties by watching U-Tube cooking videos. There she discovered that ricotta makes the most sublime creamy pasta sauce. 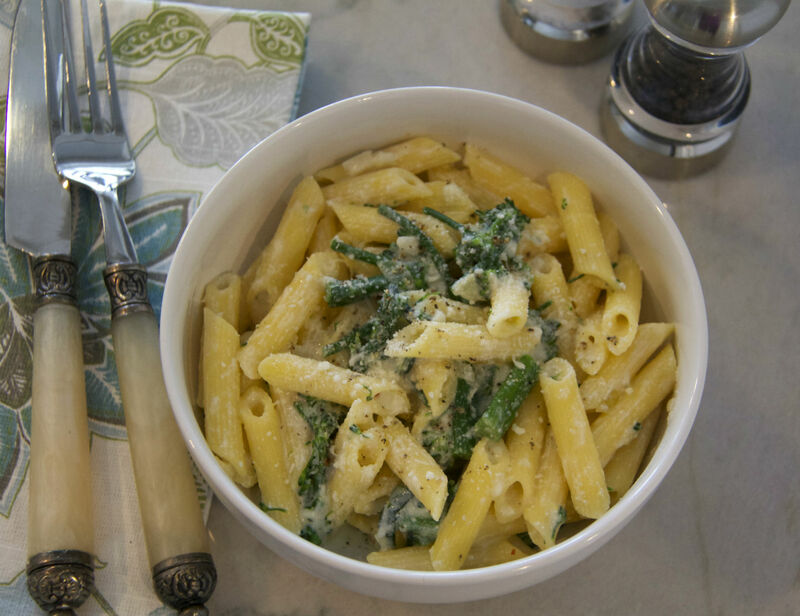 We quickly put that new found knowledge to work whipping up this Creamy Ricotta Pasta with Broccolinni. It would be perfect for a quick week night dinner, or in our case, a well deserved indulgent lunch. I absolutely love what the kids are learning in college these days. Note: sometimes when I am in a hurry I add the broccolinni, or any other fresh vegetable, to the pasta while it is cooking. Add about 1-2 minutes before you were planning to drain.